Pohnpei, FSM 31 August 2018: The Australian Government earlier this week launched an Assessment of Eliminating Violence against Women (EVAW) Services and Gaps in Services Report, which was commissioned under Australia’s Pacific Women Shaping Pacific Development program. The Report follows a previous Australia-funded national Family Health and Safety Study (FHSS) in 2014, which identified a national average of one in three women experiencing partner violence in their lifetime. The assessment, which was conducted in Pohnpei and Chuuk, sought to identify key gaps in services in order to better assist women and children in accessing services relating to domestic violence. Secretary Magdalena Walter noted the strong collaboration and close partnership that the FSM enjoys with Australia on gender issues, thanking Australia in particular for the enhancement of technical assistance being offered to the FSM in recent years. 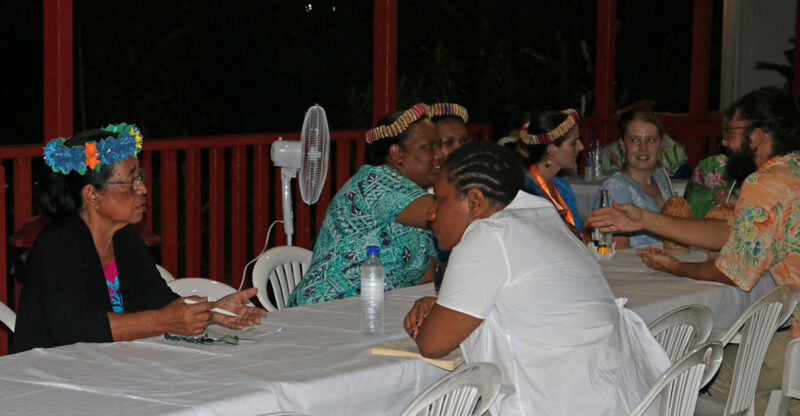 Some of this assistance includes Gender Equality Adviser Maire Dwyer, who has been based in Pohnpei for nearly three years and covers gender mainstreaming across all four states of the FSM, as well as Palau and the Marshall Islands, Family Protection Adviser Ruby Awa, who started with the FSM Department of Health & Social Affairs in November 2017 on a two year contract assisting with CEDAW Awareness and eliminating domestic violence across the FSM, and Pacific Women Business Counsellor Herolyn Movick, who has been conducting workshops across Pohnpei to help women and men develop business skills. Secretary Walter (foreground left) speaks to Kymberley Kepore, Pacific Women Support Unit Team Leader, at the Assessment Report’s launch. Photo credit: Australian Embassy, Pohnpei. The Australian Volunteers Program has also been aligned to support gender equality programs on issues that disproportionately affect women: Elly Love is a Knowledge Management Specialist working with the Micronesia Conservation Trust, Nikisha Smith is a Disability Support Officer with the Pohnpei Department of Health & Social Services, Kate Miller is a Victim Support Coordinator working with the Yap Attorney General’s Office and Jaclyn McCosker is a Gender Development Officer working with the Chuuk Women’s Council. The Report recommends an Essential Services Package model, developed by UN Women, which identifies the essential services to be provided by the health, social services, police and justice sectors. The Essential Services Package also plays a key role in poverty reduction and development, leading to enhanced efforts at achieving the 2015 Sustainable Development Goals. The 8th FSM National Women’s Conference Outcome document acknowledged the growing awareness of the need to implement laws as well as develop referral pathways and services for victims. Specific recommendations were made calling for the FSM to develop standards for services and reporting of gender-based violence and that all discussions on eliminating gender-based violence are consistent and inclusive of government agencies and all civil society.